Extrem de eleganti, aceasta pereche de cercei este realizata cu cristale Swarovski Crystal Silver Night, intr-o nuanta profunda de gri. Sunt montati pe elemente placate cu rodiu. Cerceii au tija din argint. Cristalele Swarovski au 16 mm. Lungime totala 5.5 cm. 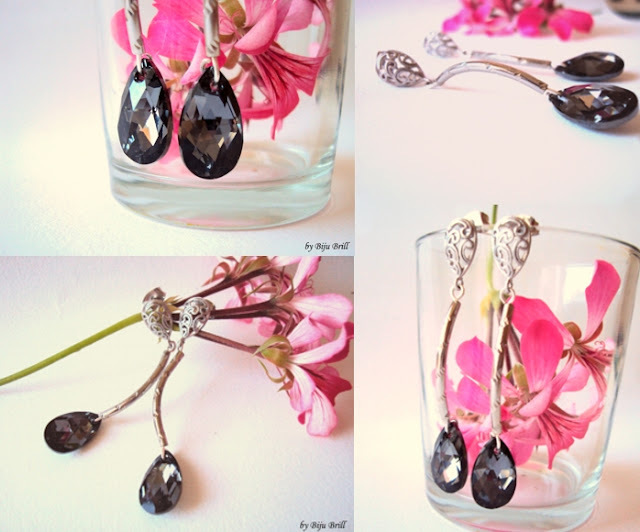 Extremely elegant, this pair of earrings is made with Swarovski Crystal Silver Night drops, in a beutiful deep gray shade. They are mounted on rhodium plated elements. The earrings have sterling silver posts. 16 mm Swarovski drops. Total length 5.5 cm. A very fun pair of earrings, perfect to wear whenever you want to feel lucky. 2 beautiful Swaovski four-leaf-clovers dangle on a long chain. They are extremely light weight and have a beautiful green color. 5.5 cm long. Extrem de indrazneti, aceasta pereche de cercei statement este realizata cu piele aurie lacuita. Fiecare floare este taiata si modelata manual in trandafiri supradimensionati. Tije placate cu argint. Diametru : 4 cm . Extremely bold, this pair of statement earrings is handmade with a wonderful gold leather. The flowers are and cut and formed into wonderful bright roses. Silver plated studs. 4 cm diameter. Cercei extrem de feminini, realizati din piele naturala in culori vibrante. Alegeti dintre turquoise, fuchsia, auriu sau orange. Fiecare trandafir este taiat si modelat manual. Tija este placata cu argint. Diametru 2 cm. Extremely feminine, these pair of earrings are handmade with genuine leather. Choose your favorite color: fuchsia, turquoise,orange and gold. Each rose is hand cut and formed. Sterling silver plated studs. 2 cm diameter. Colier vesel si indraznet, realizat din piele in nuante puternice de oranj, galben, verde si ciocolata. Fiecare floare si frunza sunt taiate si prelucrate manual, fiind accesorizate cu cate un cristal sau o margica din sticla. Se aseaza la baza gatului (baza colierului este din otel plastifiat). Unicat. 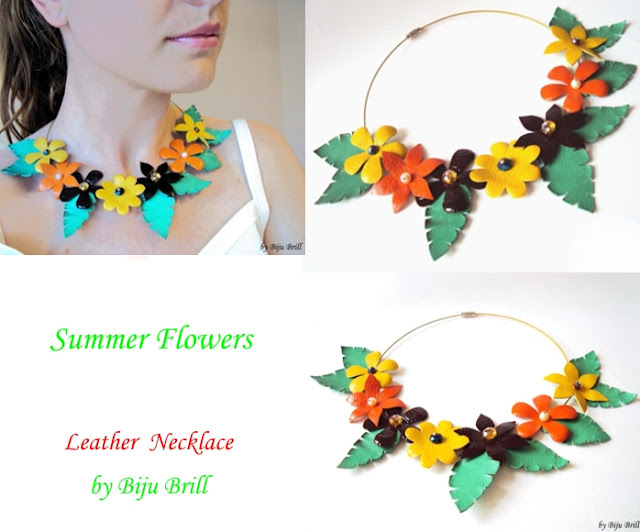 Beautiful and fun, this necklace is made out of leather in strong colors of orange,yellow,green and chocolate. Each piece is hand cut and transformed into a feminine flower that will embellish your neck! It is embellished with a crystal or a glass bead in the center that will bring more shine to the necklace. It is wonderful for this summer! The base is coated steel.One of a kind. Foarte dragalasi si simpli, acesti cercei sunt realizati cu cristale trendy Swarovski, intr-o nuanta inovatoare a anului 2011 : amethyst blend. Cerceii sunt placati cu rodiu. Lungime totala 4,5 cm. Puteti citi AICI despre inovatiile Swarovski 2011. 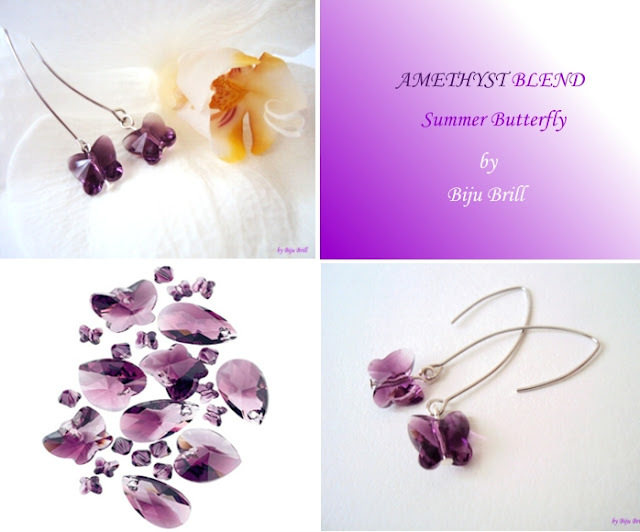 Super cute and simple, this pair of earrings are made with a trendy Swarovski butterfly in an innovative Swarovski color: amethyst blend. They are made with high quality rhodium plated ear hooks. Total length: 4.5 cm. You can read more about Swarovski innovations 20011 HERE.